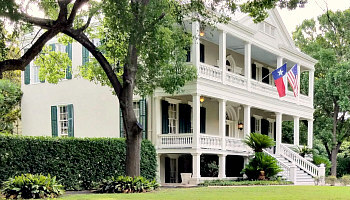 Top Budget 1st Year Anniversary Getaways in the U.S. Romantic Activity in San Antonio: As you enjoy a nighttime stroll on the famous River Walk, stop for a while at Selena’s Bridge and watch as the barges float by below. There’s a sad but romantic story behind this bridge, which you can read about on a plaque located there. In December, it’s covered with twinkling lights and makes a great backdrop for your first anniversary photo. Why San Antonio for Your First Anniversary Vacation: The Riverwalk and its extensions - Interesting history and the five Spanish Colonial Missions (including the Alamo) have received UESCO world heritage recognition - Diverse culinary scene; not just Tex-Mex food - Room rates are cheaper than other Texas destinations. Best Time of Year to Visit: If you're anniversary falls between November and April, that's great, because the weather is comfortable and prices are lower. There are also some fun festivals during this time. Fiesta San Antonio is held in April. 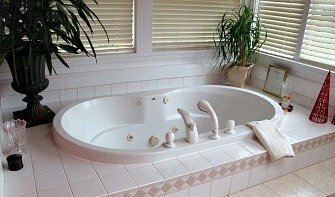 Las Vegas Budget Romantic Resorts - inexpensive stays for your anniversary in great hotels along the Strip like the Cosmopolitan, Four Seasons, Wynn Las Vegas, The Palazoo, Vdara and Venetian. Don't-Miss Romantic Spot in Las Vegas: Watch the free water fountain show outside the Bellagio Hotel. It combines music, water and lights to create a very romantic nightly experience. Why Spend Your First Anniversary in Las Vegas: The Strip! - Warm weather most months - Great shopping - Live shows - Fantastic hotel pools and spas - Excursions to the Grand Canyon and/or Red Rocks and the Hoover Dam. Best Time for an Anniversary Vacation in Las Vegas: Shoulder season (March to May and September to November) has the most moderate weather. But there are good hotel deals to be found all year round. 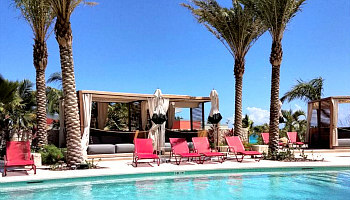 Pool season at most hotels and resorts runs from late March to October. 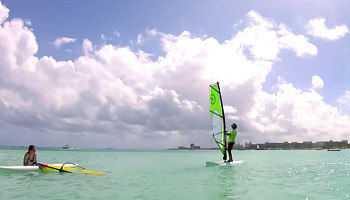 Imagine Waikiki For Your 1st Anniversary! Romantic Experience in Hawaii: On the Big Island of Hawaii, book a tour to go snorkeling or diving at night with the manta rays. Bright lights on the raft attract plankton, and the manta rays come around to eat. Various tour companies and locations are available for this unforgettable experience. Why Hawaii is a Great First Anniversary Destination: Tropical weather - Friendly people with “aloha spirit” - Excellent beaches and water activities - Terrific choice of hotels and resorts. Best Time of Year for an Anniversary Vacation in Hawaii: April, May, September and October are the least expensive times with peak season in December and January. The weather varies little from month to month, and flowers bloom all year. Lowest rainfall averages are generally in June. Why Florida is a Great Place for a 1st Anniversary Getaway: It’s not called “The Sunshine State” for nothing! 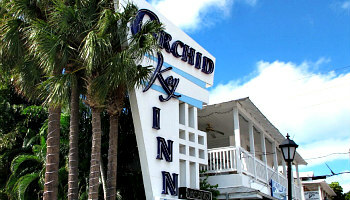 - You’re always close to a beach - Fantastic Art Deco of Miami's South Beach - World-Famous theme parks. Best Time of Year to Visit Florida: September and October tend to be the best times to visit the Gulf Coast area. Kids are in school and the weather is still warm, but winter crowds have not yet started. Ideal weather generally falls between mid-April and mid-October. Avoid Spring Break in March. Romantic Spot in Florida: In Clearwater Beach, the main attraction is still the beach itself. Clearwater is clean, not as busy as other Florida beaches, and the sand is like icing sugar! 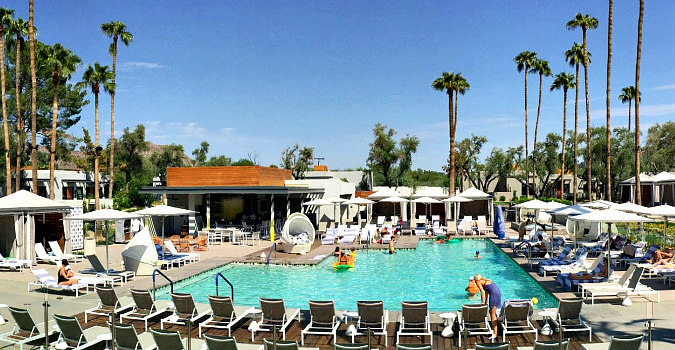 Get there early and splurge on a cabana for the day. Walk through the small shops that line the beach and stay for the spectacular sunset. Cayman Islands All-Inclusive Package Deals - book a romantic all-inclusive anniversary vacation in the Caymans starting at 4 nights for just $549 (perfect inexpensive first-year anniversary getaway). 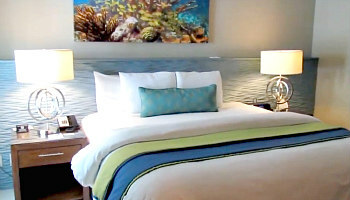 Resorts include Comfort Suites & Resort Grand Cayman, Grand Cayman Marriott Beach Resort, and the Sunshine Suites Resort Grand Cayman. Romantic Activity in Grand Cayman: Take a night time bioluminescent kayak tour and experience one of the most amazing natural phenomena in the world. Watch as the organisms that live in the bay light up the water and cause a romantic blue glow. Best Months to Take an Anniversary Trip to Grand Cayman: May through October are the warmest months, although hurricane season lasts from early June to the end of November. For great weather and fewer tourists, April might be the best month. 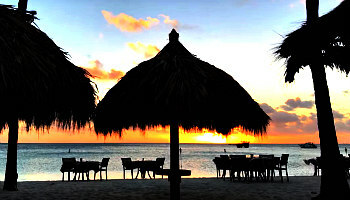 Imagine Your Anniversary Beach Dinner in Aruba! First Anniversary in Aruba - 5 Night Packages from $649 - save up to 50% on your first escape together to the Caribbean, including romantic resorts like the Tropicana Aruba Resort, Holiday Inn Beach Resort and Aruba Marriott Resort. Romantic Cruise in Aruba: Consider the Private Romantic Dinner Sail or Sunset Sail onboard the Morningstar Charter sailboat. Arrange for a few little extras such as limousine pickup, champagne or an anniversary cake. Why Aruba is a Great Anniversary Destination: Aruba has the most sunny days of all the Caribbean islands. It stays around 80 degrees all year long and the trade winds keep a gentle breeze going. It also lies just south of the hurricane belt - Pristine beaches and warm ocean water make for great snorkelling - You can drink the water right from the tap - Convenience: Many major airlines offer direct flights from North American cities and US currency is welcomed. Best Times to Enjoy Your Anniversary in Aruba: Prices are lower and crowds are smaller between April and August. The best time to swim in the ocean is October, when average water temperature is 85 degrees! 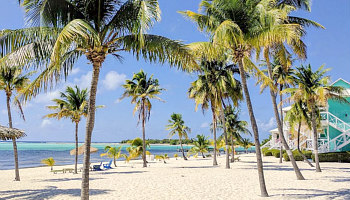 Cozumel Romantic Resort Getaway Deals - check out the best discounts on beach resorts in Cozumel from Expedia, Travelocity, Hotels.com and more. 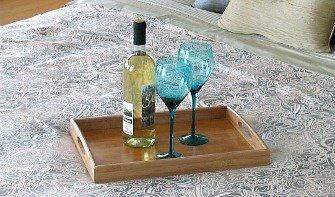 Why it’s a Great Place for a Relaxing First Anniversary Vacation: Laid-back atmosphere and relaxing way of life. Generally quiet at night - It’s quieter and crowds are smaller than Playa del Carman, but there is still easy and frequent access to it just across the channel. You can also do a day trip to experience Mayan ruins. - Great food and restaurants that go well beyond tacos and salsa. Best Time for an Anniversary Celebration in Cozumel: The warmest weather is between March and June, when daytime temperatures are around 90 degrees. Temperatures in winter months range between upper 60's and low 80's. Winter-time is peak season and prices are higher. May offers warm weather without a lot of kids, since American schools are still in session. Romantic Anniversary Package in Cozumel: Mr. Sancho's is a private beach club in Cozumel. 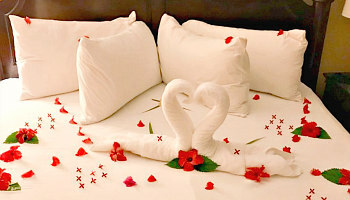 It offers a Romantic Day Beach Pass for Two that is perfect for an anniversary celebration. 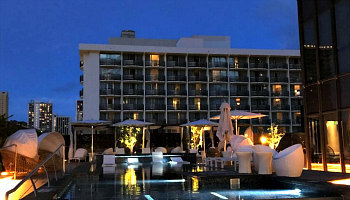 The all-inclusive package allows for all food and drink, cabana reservation, and couple’s massage. Be as active or relaxed as you desire, as you decide between various activities available. Sandals Can Make Your First Anniversary Special! 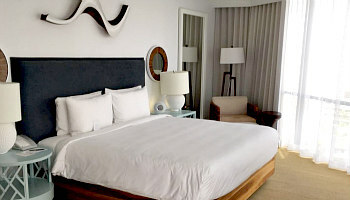 Sandals Ochi Beach Resort - What Other Couples Liked: Four Poster King Beds...Rabbit Hole Night Club...Suites with Private & Semi Private Pools. 2018 ERV Rating* for a Romantic Caribbean Anniversary: 85% - Excellent. 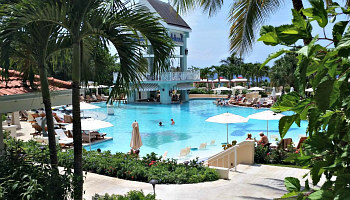 Why Ocho Rios is a Fun Place for an Anniversary Vacation: Jamaican cuisine - Great shopping - Unique tours and outdoor adventures - Turquoise water and soft sand at several beautiful beaches. When to Plan Your Sandals Ocho Rios Anniversary Getaway: The peak hurricane season in this area falls between mid-August and mid-September. The busiest and most expensive time to go is between mid-December through mid-April. March usually has the lowest rainfall of any month. Either early May or mid-November seem to be good compromises. Romantic Activity: Learn how to SNUBA! Combining the best of scuba diving and snorkelling, a quick 15-minute lesson will get you in the water and appreciating colourful marine life at depths of 20 feet and up. Cheap 1st Anniversary Vacations in Los Cabos - save up to 30% on romantic and affordable resorts like the Playa Grande, Bahia Hotel & Beach House, and Villa del Palmar Beach Resort & Spa. Best Time for a Romantic Los Cabos Vacation: In May and June, the crowds have mostly gone home and the summer storms have not yet hit. October and November are also good, but book early and expect it to be busier. Avoid Spring Break if possible. Romantic Activity: Arrange for a romantic horse-back ride along secluded beaches. Contact Cuadra San Francisco Equestrian Center for details and booking. No previous experience required. Why Plan an Anniversary Vacation in Phoenix: - Beautiful sunsets - Interesting flowers and cacti all year ‘round - Great hiking spots - Free or very inexpensive bus rides - Plentiful Mexican food - Sunshine and year ‘round swimming. Phoenix Romantic Thing To Do: Hot air balloon rides are available almost all year long, so it doesn’t matter when your anniversary falls. Book a sunset ride that includes snacks and champagne! Why San Diego for Your Anniversary: It doesn’t get too hot or too cold. 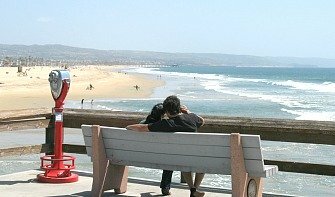 Average temperature is 70 degrees - Great beaches and coastal views - Old Town San Diego and its fascinating history as the birthplace of California - The unpretentious culinary scene. Best Time of Year for an Anniversary in San Diego: Crowds and prices drop around October and November. Winter months are usually warm (though not quite beach weather), and hotel prices are at their lowest. March and April are good months to visit. Romantic Activity: Ride around the Coranado Cays in a Gondola! Private rides can be arranged along with a nice bottle of wine and chocolate-covered strawberries. Hotel Ranga: First Anniversary Adventure Holiday in Iceland - there are many ways to see the Northern Lights, but if you stay at the Hotel Ranga, they cater to aurora seekers. The hotel is far enough outside the city to allow for great views, especially between September and April. They offer a wake-up call when the lights come out as well as all the comforts to make viewing a real pleasure. You may also choose to watch from the hotel’s observatory, where you will find a resident astronomer to answer questions and several telescopes to watch the show. What Other Couples Liked: Free Stargazing Tours...Romantic Log Cabin Feel...Exceptional Breakfast with Salmon and Champagne. 2018 ERV Rating* for a Romantic Iceland Hotels: 90% - Excellent. Best Time of Year to Visit Iceland: The Northern Lights are most likely to be seen from September to mid-April. That’s because they are best seen in a full dark sky. Daylight lasts almost 24 hours from mid-May to late July. Mid-June through August is the busiest tourist season. 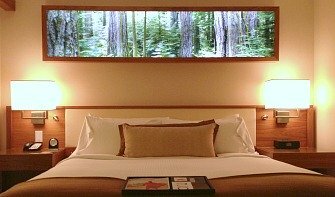 The Perfect Hotel for Your 1st Anniversary in New Zealand - the U.S. dollar goes a long way Downunder in New Zealand, and makes it quite possible to enjoy some great accommodation at very reasonable rates, like the Sebel Quay West Auckland and Hotel St Moritz Queenstown in the South Island. Why Visit New Zealand’s South Island: - Diverse and unspoiled scenery (glaciers, lakes, mountains and plains) -“Kiwis” are friendly and welcoming and there is great ethnic diversity among the people - tons of outdoor activities to choose from - Bird and plant species that don’t exist anywhere else in the world - Great wineries and vineyards - Sparse population means you can find quiet solitude. Best Time of Year to Visit South Island of New Zealand: Keep in mind that the climate between North and South Islands can be quite different, and that New Zealand is in the Southern Hemisphere. Seasons are opposite to those in North America. Summer falls in December, January and February and is the most popular time for tourism. Fall (March, April and May) is less busy and still quite warm. Autumn can offer spectacular foliage colors! 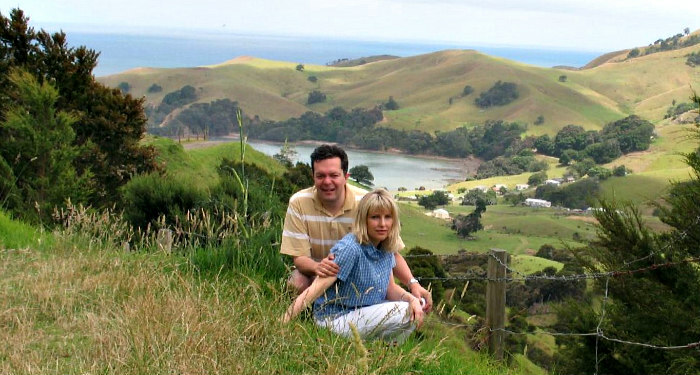 Romantic Spot in New Zealand's South Island: Visit Larnach Castle in Dunedin. Wander the gardens and tour the building or (by prior arrangement) dine in the castle and stay a night on the grounds. Be sure to get photos from the turret, as the view of surrounding landscape amazing.